FrameMaster is a FEM-program that helps you dimension almost all kinds of constructions: roof-trusses, floors, walls, bridges,furniture, shafts and much much more. FrameMaster is both one of the cheapest and most powerful program in its category. 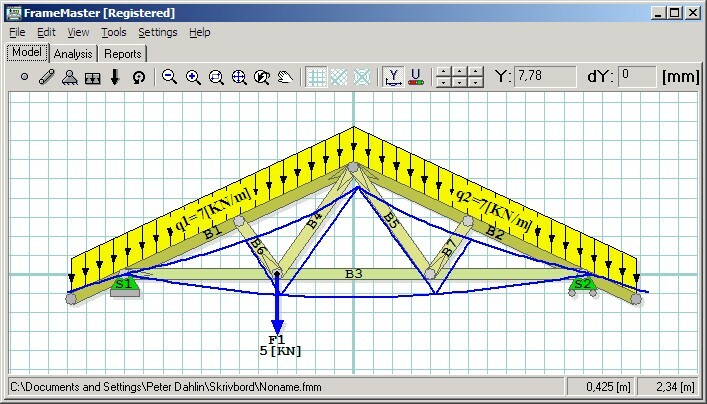 FrameMaster is used of both amateurs and professionals.Avoid over dimensioning, instead model your construction in FrameMaster and the program will tell you if the construction is strong enough or not! ...... tell you if the construction is strong enough or not, it cant bee much simpler than that! Impress on your colleagues and customers with professional printouts from FrameMaster, show them that you know what you are doing, that your constructions are well designed and that you don't dimension at random. Qweas is providing links to FrameMaster 3.1 as a courtesy, and makes no representations regarding FrameMaster or any other applications or any information related thereto. Any questions, complaints or claims regarding this application FrameMaster 3.1 must be directed to the appropriate software vendor. You may click the publisher link of FrameMaster on the top of this page to get more details about the vendor.